From creating a price estimate to putting the finishing touches on your restored book, Julia and Matt Larson work together to repair your books every step of the way. For over ten years, Julia has been reviving the lives of books throughout the world, performing "face lifts" on hundreds of books. After taking a few courses at a Madison bindery, Julia was hooked. As she restored more books, she honed her skills and became a self-taught expert in book repair. 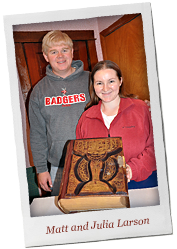 Working from their home in Nelson, Wisconsin, the Larson's find restoring family Bibles and heirlooms very rewarding. Now with three girls in tow, the Larson's are making a name for themselves in the book restoration world. 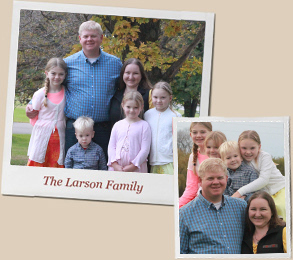 From small children's books to large family Bibles, the Larson's breathe new life into your precious books and heirlooms. Contact them today to see how they can help restore your favorite cook books, photo albums, and family Bibles. Call 800-504-9341 today! Julia Stanley is your battered book's best friend. Does an aging publication have a broken or disconnected spine? Piece of cake. In today's world of electronic wonders, anyone can instantly access the information superhighway with just a click of a mouse. But nothing can replace a good book. Julia Stanley, the daughter of a minister, holds a special place in her heart for the Good Book.